I love the green slippers. I forgot how nice and comfortable they could be. This is what I’ve been wearing on my feet since I tossed my leather moccasin-type slippers last year when the soles had more holes than leather. Am I tossing the imitation-crocodile-faux-sheep-fleece footwear? No. I still need something quick to slip on when I have to run outside or go to the garage and it’s cold and wet…but only for a few minutes. Anything longer and I’ll put on real shoes. My grandmother and aunt used to have a stash of these slippers (only their’s were knitted flat) and we would get a new pair whenever the previous ones were beyond repair. They used scraps of fabric for the soles to make them last longer. Without soles, they would have holes in them within a few weeks. At a rummage sale a long, long, long time ago my mother found a handknit purple dress with bright pink, grey and white stripes along the cuffs, neckline and hem. I seriously doubt the dress had ever been worn. Ugly doesn’t come close to describing it. My grandmother ripped the dress apart, soaked the yarn to remove the kinks and wound the yarn into balls. There was more purple than any of the other colors and enough to make at least two sweaters but no one in my family wanted any garment out of those colors. So she made these slippers. Using two strands of yarn held together, she knit purple slippers, purple and pink slippers, purple and white slippers, purple and grey slippers and some were made with all four colors. Some had big purple pom poms on them. 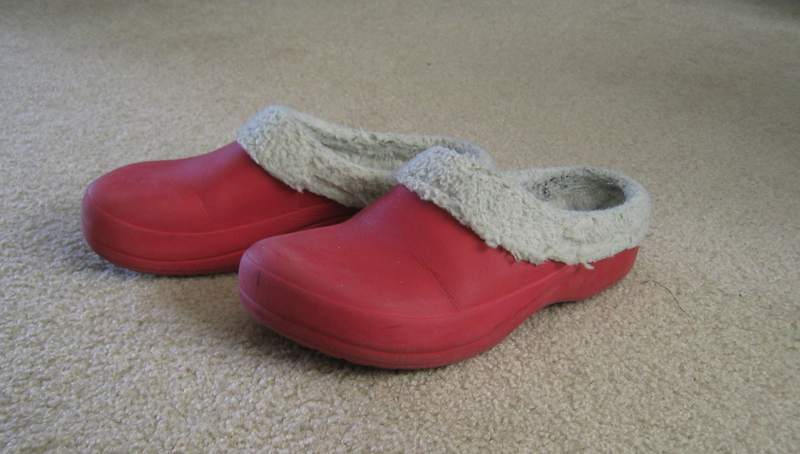 When Mr. Aitch and I were first married, my aunt, Miss Kay, gave him a pair of these slippers. He loved them. When they wore out, I knit him a new pair. I made these for my children when they were old enough to keep something on their feet. Now that I found the perfect soles, I should knit at least one pair a month to add to my stash. See pattern to the right. 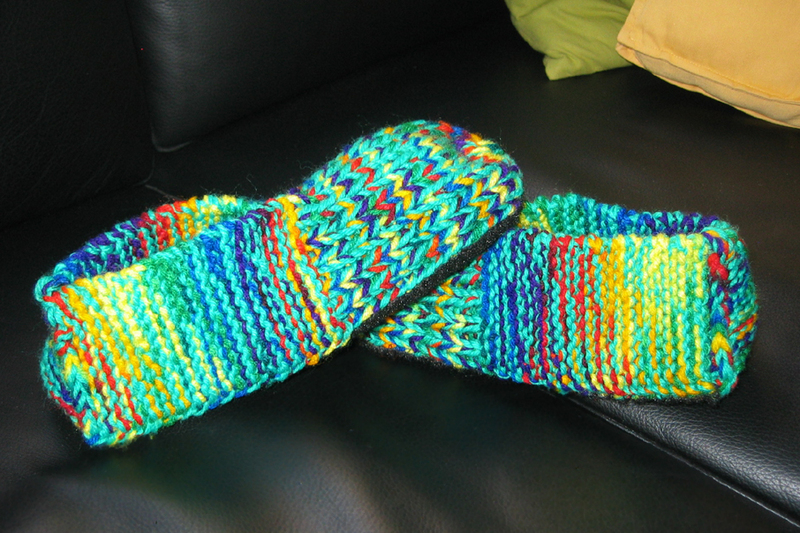 This entry was posted in finished objects, knitting and tagged knitting, seamless slippers by Patti_is_knittinginflashes. Bookmark the permalink. yes, I remember those purple pink- and white slippers. I don’t remember how many slippers I got from that dress. I’m glad I found a pattern for the heel so that when I was finished kitting the slippesrs, I had very little to sew to finish the slippers.. I refer you to this post. When they’re beyond repair, time for new ones.